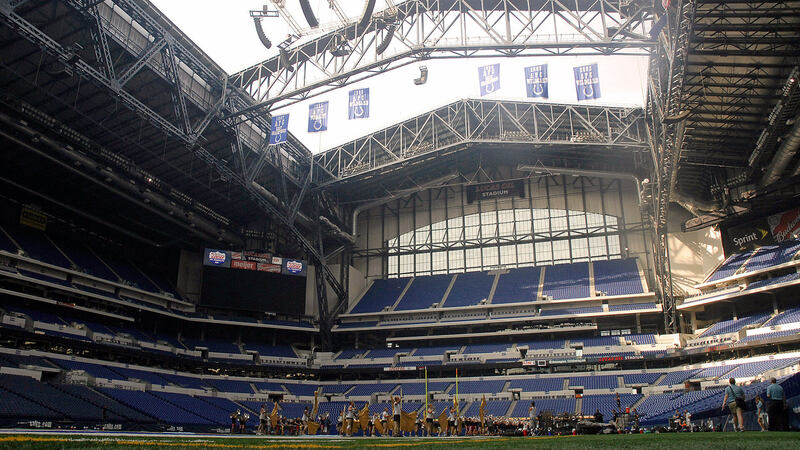 Weather permitting, the retractable roof at Lucas Oil Stadium will be open at Wednesday’s DCI Tour Premiere, which will officially kick off the 2015 Drum Corps International Tour in Indianapolis. According to DCI Executive Director and CEO Dan Acheson, the final decision for the roof opening will come down to hour-by-hour weather reports on Wednesday, June 17. By facility guidelines, if any precipitation is within the vicinity of Lucas Oil Stadium, the temperature is below 40 degrees, or wind gusts are greater than 40 miles per hour, the roof must stay closed. The two roof panels take between 9 and 11 minutes to release or close, resulting in a 176,400 square foot opening. Outside of a rehearsal of the Glassmen in 2010 used to test the acoustics of the stadium during performances, drum corps have never competed under an open roof in the six years that DCI has hosted events at the state-of-the-art facility. While DCI had plans to retract the roof during the first night of World Championship competition in 2010, excessive heat in the Indianapolis area led to its closure. Buy tickets to the 2015 DCI Tour Premiere in Indianapolis.